Ideal for both exterior and interior home and business locations. Available if required in a larger size. Please contact us for more information. Authentically made and cast in the Black Country by Lumley Designs. British railway logo name sign, solid cast iron, recreated in the style of the famous historical British railway logo design. 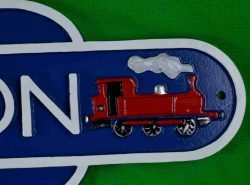 Complete your British railway name sign with personalized wording, names and phrases, additionally add interest and perfect your sign with hand sculptured motifs and colour coordinate to suit both your interior or location. Suitable for exterior and interior spaces, perfects your interior design concept in both home and business surroundings. Truly manufactured in great Britain by Lumley Designs. 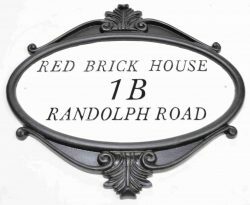 Each is individually custom made with raised permanent solid cast wording, names and motifs by Robin Lumley pattern-maker, designer and cast iron manufacturer. 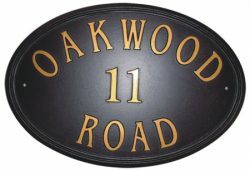 Your sign is easy to order, please select your options from the boxes to the right of the page the first box enter plaque colour required, second box letter colour, and finally the last two boxes add the text and if required the motif design. 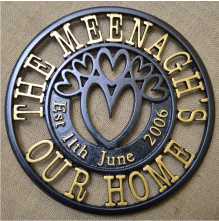 Alternatively please contact us if you require any changes made that are not listed on the web page we can custom make signs to your specifications. For a more personal service and information please contact us to place your order and if you wish use our safe credit card or debit card facility. Lumley designs will always do our foremost to fulfill your requirements.